Nothing says “Celebrate!” better than a glass of bubbly champagne. Celebrate the newly engaged couple with an engagement party that bubbles with excitement and love. 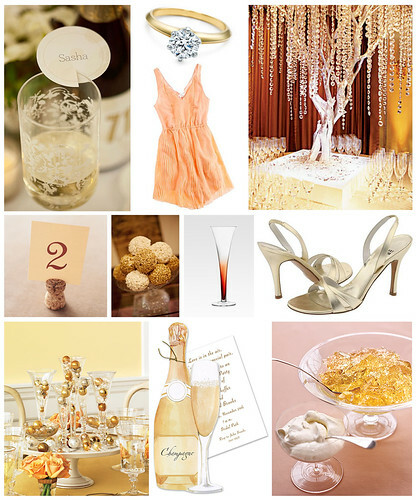 A champagne theme is the perfect choice for such a soiree. The blushing bride will look lovely in a peach-colored cocktail dress and gold heels. She is sure to shine while showing off her brand new engagement ring -- Cocktail dress by Madewell, heels by Stuart Weitzman at Zappos, ring by Tiffany & Co.